Cloudy With A Chance Of Meatballs sequel has debuted at number one in the US, taking $35 million in its first weekend. In doing so, it surpassed the original movie, which took $30.3 million during its opening weekend in 2009. Last week’s top film, Prisoners, starring Jake Gyllenhaal and Hugh Jackman slipped to second place. Formula One movie Rush, which depicts the rivalry between James Hunt and Niki Lauda, took third spot. Based on a children’s book, Cloudy With A Chance Of Meatballs was a breakout hit for Sony Animation in 2009. 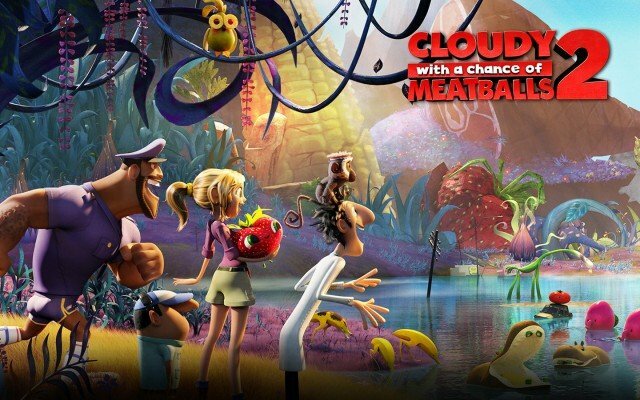 Cloudy With A Chance Of Meatballs 2 is an original story, in which inventor Flint Lockwood must save the day after one of his inventions malfunctions, creating food-animal creatures that overtake the region of Swallow Falls. It has been well-received by US critics: The New York Daily News called it “loud, weird and chaotic”, while Variety praised its “zany tone and manic pace”. However, its multi-million dollar box office haul was atypical in a week where new releases performed below expectations. Comedy movie Baggage Claim, starring Paula Patton as a woman on a mission to find a partner, opened in fourth spot with $9.3 million. And drama Don Jon, starring Scarlett Johansson, Julianne Moore and Joseph Gordon-Levitt, opened at number five with $9 million.